The resurrection of the Royal Gorge cross country ski resort this year under the management of Sugar Bowl has been great for all us skiers, both skaters and striders, that like to burn up the groomed trails. 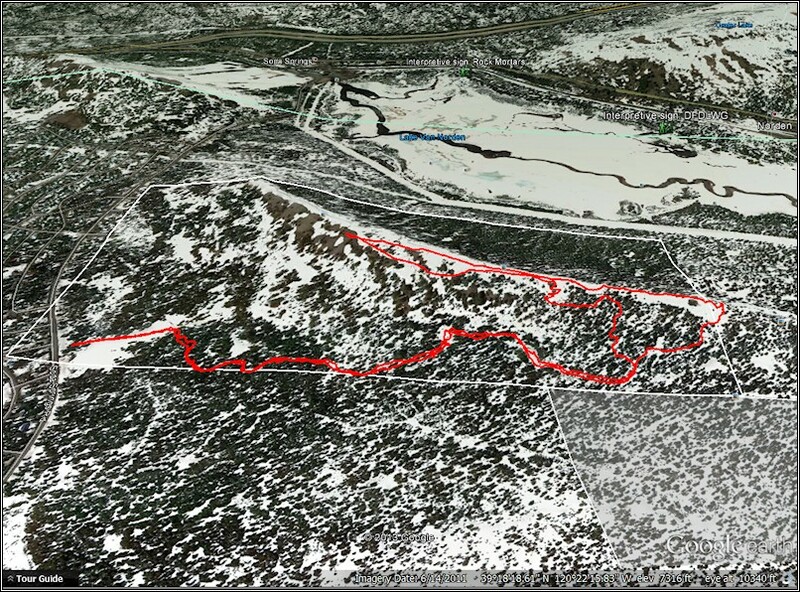 However, there are some of us that like to get off the trail once in a while and get in a back country ski. 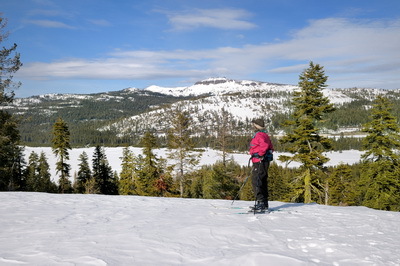 Sure we can head up to Castle Valley on the north side of I80, but I’m happy to say that there is still a very good backcountry skiing opportunity that is easily accessible from the Serene Lakes Community. Just east of Soda Springs Rd at the meadow at the end of Beacon St in Serene Lakes is a 300 acre parcel of US Forest Service land that encompasses the ridge that separates Van Norden Meadow from Serene Lakes, know locally as Forest Service Ridge. The ridge affords spectacular views of the entire Summit Valley and the Serene Lakes Basin. Skiing to the top of the ridge is a great back country experience that winds through beautiful forest and gently climbs up the east side of the ridge to the treeless ridgetop. The trail is approximately two miles to the top of the ridge with just one or two climbs that are steep enough to give you a workout. Skiing along the ridge gives you spectacular views on both sides. After a heavy snow you might have to break trail, but the ridge with a pristine coating of snow is a beauty to behold. Because it is a fairly popular ski for the locals, there are usally a couple of tracks laid down that lighten the load for trail breaking. There are a couple of things to keep in mind before you head up to the ridge. For anyone that has been up there in the summer, you know that the ridge line is quite rocky. I recommend that you only do this ski when there is plenty of snow on the ground to cover up the rocks. It’s probably preferable that the snow be pretty fresh because old icy snow can make climbing and skiing back down a little tricky. The winds sweep the ridge so you probably don’t wand to do it on a windy or stormy day. Even with plenty of snow, there can be windswept bare areas, so watch out for rocks and fallen trees. The west end of the ridge is quite a bit rockier and steeper than the east end, so if you want to make a loop out of this ski make sure that there is plenty of snow and you can handle steep slopes coming down through the trees. The east end of the ridge is usually skiable even without heavy snow coverage, so going back down the way you came up may be a better alternative. Before doing this ski, you should also be aware that you have to cross the Sidewinder ski trail maintained by Royal Gorge resort. The land itself is Forest Service land, but Royal Gorge does have permits for the use of their trails and technically you do have to cross the trail, although this seems like a very minor infraction. However, if you do come down the west side of the ridge, you may have to ski for a couple of hundred yards on the groomed trail to get back over to Beacon meadow. Personally, I have a Royal Gorge season pass, so for me this isn’t really an issue, but for those of you that don’t, you should be aware of this complication. So if you have an itch to get those back country skis out and get off the groomed stuff, you might want to give the ridge a go.